There are several methods to graph a linear equation. how to graph linear equations by plotting points. how to graph linear equations by finding the x-intercept and y-intercept. 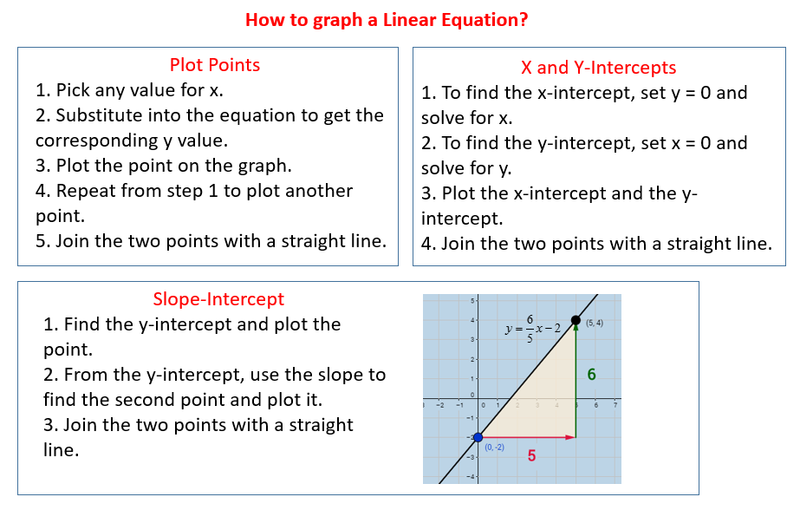 how to graph linear equations using the slope and y-intercept. The following diagrams show the different methods to graph a linear equation. Scroll down the page for more examples and solutions. Choose any value for x and substitute into the equation to get the corresponding value for y. If possible, try to choose values of x that will give whole numbers for y to make it easier to plot. How to use a t-table to graph linear equations? How to graph a linear equation by plotting points? The x-intercept is where the line crosses the x-axis. At this point, the y-coordinate is 0. The y-intercept is where the line crosses the y-axis. At this point, the x-coordinate is 0. When an equation is written in general form it is easier to graph the equation by finding the intercepts. Step 3: Plot the intercepts, label each point, and draw a straight line through these points. How to find intercepts and use intercepts to graph linear equation? 3. Find the intercepts and graph. 4) Plot the points and graph. How to graph Linear Functions by finding the X-Intercept and Y-Intercept of the Function? We can use the slope and y-intercept to graph a linear equation. y = mx + b, where m is the slope of the line and b is the y-intercept. How to graph an equation given in slope-intercept form? Step 1: Find the y-intercept and plot the point. Step 2: From the y-intercept, use the slope to find the second point and plot it. Step 3: Draw a line to connect the two points. What is the slope intercept formula and how to graph the equation? How to graph a linear equation given in slope intercept form? The equation y = mx + b is called the slope-intercept form of a line.